Well... I finished Part II today! And I have to say, although book I started off with a bit of disappointment, it hasn't slowed down since ! After a scary beginning, when I thought they were going to do to me in book II what they did in book I (100 pages that could have easily been only 50).. the story introduced a new character in the form of a young boy named Will. From the moment they met, in a world that was not Lyra's nor was it Will's, they managed to get in and out of trouble constantly! When IN trouble it was a bit scary... and then the unexpected would happen to them and it was off to get into MORE trouble! Eventually, Lyra and Will go in search for the Subtle Knife, not knowing why it's so important. They soon find out.. and after having two fingers cut off in a fight Will becomes the "bearer" of the knife. Pursued by Spectors, Evil children, Lyra's evil mother and creatures never before heard of they adventure out to find Will's father. I have to say that I do enjoy the characters and the adventure that's being told. 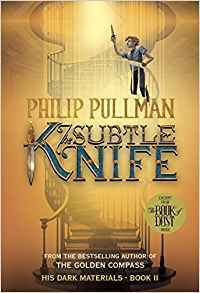 As of the end of the Subtle Knife there are now Three "worlds" that are functioning in this story... and the Subtle Knife is able to "cut through" to any of them! I'm glad I purchased this book.. and now I really want to see the movie!!! Notice how many pages?? Heh.. well actually this book is a combination of all 3 books that make up the trilogy.. and I just finished the first part: The Golden Compass. 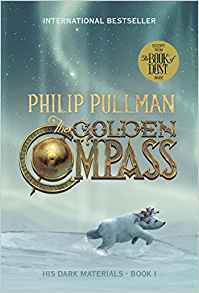 Anyway.. since The Golden Compass is due out any day now as a movie, I thought I'd read it first to see what all the fuss was over. I was anticipating that it would grab me right up as many YA books have done. But that didn't happen and that really surprised me. It wasn't until around 100 pages into it that it finally grabbed me.. and then it took off like shot! From there until the end of book one I read fairly quickly because I always wanted to know "what next?!".. it was very good, and I can see that if the movie studios did good by it where it would make a great movie. The main character of Lyra is well defined and you are given information so that you feel as if you know her... but do you really? (since she doesn't know herself...) The story begins with Lyra and her kitchen friend Roger always sneaking around on roof tops and underground at Oxford where she spends most of her time ignoring lessons and having fun. What she doesn't know is her life, as she knows it, is about to change and the choices she makes could affect more than just herself and her daemon Pan. Once I got past a certain point I really enjoyed this story... but I have to say, that the fact it didn't make me love it instantly was a disappointment, and to be honest.. so was the ending! It was wrapped up rather quickly and I found myself thinking that something felt missing . Now I know it continues in two more books, and I've even begun book 2.. and similar to book one, as I read the first few pages I found myself wondering if this was really the second book...., where did this come from? What happened to the other characters? I know it will tie in sooner or later, but this is not what I am used to. When I read trilogies, generally book two picks up where one left off and lets you know a little something more before surging ahead and putting in new characters and new places. I know these books have won awards and now even a movie contract, so I know I'm in the minority here when I say that I have a feeling I will enjoy the movies more than the books... but I will continue to read... at least I hope so. Book one was only 296 pages so I have a long way to go yet... I am generally pulled into a book before 100 pages, or before I start thinking, maybe this isn't for me... I've got my fingers crossed here! Yorsh is the last of his kind, an elf child in a world that despises elves. He seeks warmth, food, and shelter but has found only cold, rain, and despair. When he meets two unlikely companionships-humans who help him in spite of their prejudices-Yorsh learns of a prophecy concerning the last dragon and the last elf: when these two break the circle there will be a new beginning. The trio experience a host of comical misunderstandings that offset the dangerous situations they encounter in the Dark Mountains. Almost by chance, Yorsh stumbles across the dragon, but he finds that fulfilling the prophecy is steeped in complications. I am trying to figure out how I actually feel about this book. On one hand, as I read.. I enjoyed it. On the other hand... when I set it down I did not have that feeling of: maybe I'll read just one more chapter each time I saw the book. So, although I enjoyed the book..at the same time, I don't think it's a book I will read over, like many of my favorite books. This is a fairy tale. I didn't feel the closeness to the characters as I do in many books that I read.. but it was a good story. 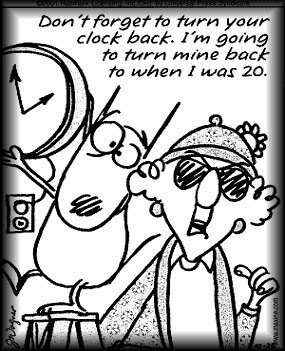 Some life's lessons learned, or in the case of us elderly.. reminded of. There were some comical parts that made me smile.. and some sad parts that.. well.. made me sad. ... and it is a book I think my grandson would enjoy. So I guess I'd say.. it's a good book, but just wasn't my thing. 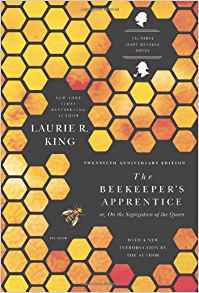 This is the first book of many that Laurie R King has written about Mary Russell, the lady who eventually becomes Mrs. Sherlock Holmes. I wanted to read this one (since I already read The Moor) to see how they met and what they were like then. There were some differences between The Moor and this book.. mostly I didn't find quite as much of the humor I found in the Moor. But.. for one, I needed to see how it all began. And two: I wanted to hear those voices in my head again of Basil Rathbone and Nigel Bruce!! (I can't help loving those old old black and white movies, Hound of the Baskervilles, was always my favorite!). At age 15 Mary Russell meets Sherlock Holmes, retired in Sussex Downs where Conan Doyle left him retired and raising bees. Mary, is an orphan rebelling against her guardian aunt. She impresses Holmes with her intelligence and Holmes takes her under his wing and teachers her the mysteries of detection, allowing her to participate in a few cases . The cases begin very simple but as do many things.. they progress, until one day they find both of their lives at stake. It's either solve the case or die trying. During the story you get to meet Watson, who at the time is also retired. Familiar characters and/ or mention of them (such as Moriarty) pop up during this story. This was an excellent book to read and I wouldn't have missed it! Were I to have to choose which of the two books I've read as a favorite though.. it would still be "The Moor". Partly for the humor and partly because it brought back much of the old Hound of the Baskervilles! I am sure that I will read more of Laurie R King's work (I like this Mary Russell !).. and also checking on getting a copy of Hound of the Baskerville's! The Thief Queens Daughter by Elizabeth Haydon. Ah yes.. well I did so enjoy The Floating Island that I had to send for the second book The Thief Queen's Daughter. 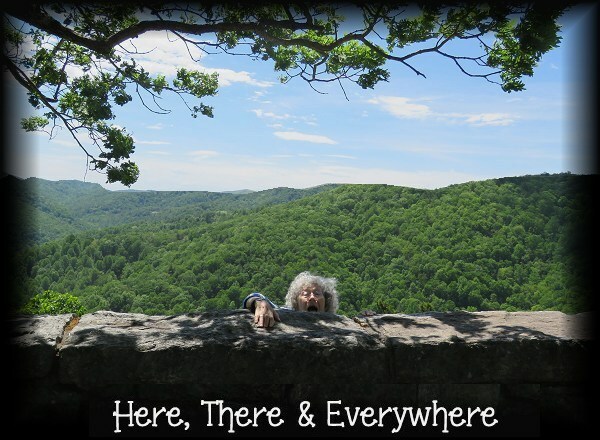 Elizabeth Haydon has set herself up for as many sequels as she may want to write. (or as many lessons as there are to be learned). I like the young characters she has made and how she pulled them together to form a group of friends, no matter what their differences. I can say that I will follow the sequels... because after 2 books I totally expect the sequels to be of the same quality... which means, I'd enjoy them. In the Thief Queen's Daughter the king (who seems to be the sort of King everyone would want) sends Ven to the Gated City in Kingston, which is filled with thieves and relatives of thieves and ruled by the Thief Queen, and where "some of the most magical and exotic goods in the world are sold." His mission for the king: is to solve the riddle of a mysterious light stone. He is accompanied by four good friends, one of whom is kidnapped, and the search for her is nothing less than frightening, though they find some individuals willing to help. There are scary parts and happy parts and one big surprise along the way. All in all, I can honestly say I really enjoy this authors story telling and the characters she has created! 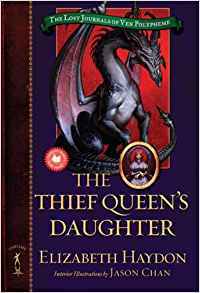 If I had to say something I didn't like about the book it would only be that The Thief Queen's Daughter was released this past June, which means I have a long wait for the next book to come out. I have to admit, after reading these two books I was curious as to why dragons are on the cover , but in book two (at the end) the author lets us know that book three concerns a dragon.. now I get it. Princess Rosalind Pendragon is meant to fulfill a 600-year-old prophecy from Merlin that she will restore her family's good name and end a war. Rosalind was born with one dragon talon, which is a fearful secret known only to the teen and her mother. It is kept hidden and over the years, the queen tries desperately to find a cure for the curse. When Rosalind reveals her claw to Lord Faul, a dragon that has been terrorizing the island, he steals her to be nursemaid to his motherless children where she learns of her dragon blood . 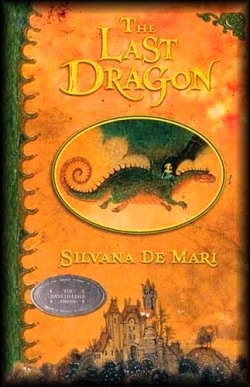 Rosalind and the dragons are bound together in a complex relationship that, in the end, helps her fulfill the prophecy. During this book Rosalind ages from 14-17 yrs old. I was a bit surprised it is a YA book... though it resembles a fairytale in it's telling. The storytelling was a bit different from most of the YA books I've been reading, but I quite enjoyed the differences! Yes, yet another great read!! Chris Howard: a young man who has aimed his life at helping troubled children, a voracious reader, and a computer friend. This post is to say thank-you to Chris. The only way I know Chris is through the computer.. blogging to be specific. I found Chris through Carl's Stainless Steel Droppings when I noticed he liked many books that I liked. So I began leaving comments on his blog, Chris was nice enough to do the same at my blog. Back and forth, back and forth we went , until one day I upped and asked a favor of him. I asked Chris if he would read the (trilogy) story I wrote and give me some input on it. The truth is, I think I needed to be with the characters again and although I can do that alone, I really wanted to talk with someone about them. Needless to say Chris said he would. Well.. actually, since he's such an avid reader.. he more or less jumped at the chance! As we talked about him doing this I guess I mentioned that he'd have to read it "as is" typo's and mistakes and all. This did not seem to bother him. In fact he went so far as to offer to catch and send any "boo-boo's" that he found. I thought this might take away from him possibly enjoying the read if he kept stopping to type up mistakes, but he said he didn't think it would bother him. And so time passed. Chris read all 3 parts to the story, with a flow of the boo-boo's coming my way along with comments on what he had read. Not only did he do all of this, but at the end of each one he wrote a review! (can you see me smiling?) He wrote raving reviews! Does he know how to brown nose or what?! !...except, I have nothing he would want for him to do that for. He really liked them! Let me try to tell you how good that feels... or maybe not. I'm not sure there are words that can express the feeling you get when someone enjoys talking about the characters and story you wrote and thinks what you wrote is GOOD! So I wanted to write this post to say Thank You to Chris. Thank you for the work you did, and thank you for bringing my heart and mind back to something I love. During the time we were emailing about what he was reading, we also talked about the fact that Chris himself is now writing a story! He is challenging himself once more and joined in the Nano Wrimo.. which is to write a novel of 50,000 words in one month. So now we talk even a bit deeper.. now I get to ask him if he is hearing his characters voices as he writes, and if his characters have taken their own direction and moved him into areas he never thought to go! I have to say, I like these conversations as much as I enjoyed when we talked of my story! It brings to mind the feelings I had when these things happened to me. And we both voiced the same opinion that there isn't a person alive that shouldn't write something, so that they can hear the voices and go where they never expected to go! We agreed that it doesn't mean you have to want to be a writer at all.. but the feelings you get are so wonderful and so different from anything else that everyone deserves to feel them. Everyone has a story.. actually, everyone has many stories to tell. Some just don't think they deserve to be written down... untrue. Some think you have to want to be a writer.. you don't. Some think it's silly... it's not. Thank you again and again Chris... I hope you enjoy your writing experience as much as I did! Yesterday, being election day, David had the day off... which means, once he's up and about, I don't have to do as much for my brother because he is already downstairs to do things! (ahhhhhh, can you hear my back and foot sighing with some relief?!). So this gave me time to sit with my dang foot ( I am soooooo sick of this heavy boot you can't imagine!) up on the bed and read more than normal.. so of course, I did! Although this book is over 300 pages, it is a YA book and a fast read... also I quite enjoyed it! I swear, I wish we had many of these YA authors when I was a kid! Not that what we had wasn't good! It was! Just not as many or as varied. 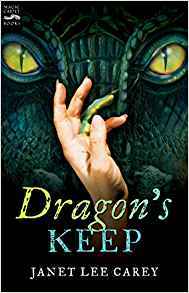 In this book, a young orphaned girl named Creel, who is living with a poor aunt is offered to the local dragon, hoping that a knight might come to Creel's aid will want to marry the rescued maiden. What's not expected is that Creel meets and befriends the local dragon . 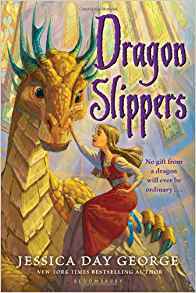 She then heads to the city, hoping to start a dress shop Along the way, she meets new dragons and receives a mysterious pair of slippers, which begins to change everything. This is yet another super piece of story telling, picking up speed as the story goes on until the final ending, which brings a smile to your face. This book would probably be enjoyed by girls rather than boys, and having been one of those once, I too enjoyed it. As far as I can tell this is a stand-alone book.. which seems to be a rare thing lately! heh. If you like to listen to someone talk and tell you a story.. this book is for you. 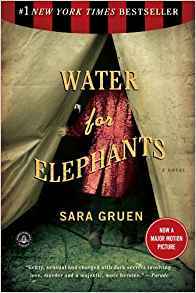 Other than knowing this book is a New York Times Best Seller and it had to do with a circus I didn't really know much about it. Whenever I saw a review, it was always raved about so I thought I'd give it a shot. Since reading this book, I can safely say that it deserves all the raves it gets! This is not my typical type of book, so I was surprised that I had such a hard time setting it down for very long. The book is about Jacob, a man in his 90's, living in a nursing home who has flashbacks about his life, his love, his friendships, and the animals with the circus. When he's not remembering his life back then he is in the present, unhappily, at the nursing home. I have to admit, since my brother is in and out of rehab/ nursing homes on a regular basis, and the fact that I am old... the parts that describe the nursing home and how the inhabitants feel hit things right on the mark, and I found myself somewhat depressed thinking that this is how the majority of us elderly will wind up. But the story he tells is fascinating and told in a voice that makes you feel you are right there with him. When you've five, you know your age down tot he month. Even in your twenties you know how old you are. I'm twenty-three, you say, or maybe twenty-seven. But then in your thirties something strange starts to happen. It's a mere hiccup at first, an instant of hesitation. How old are you? Oh, I'm--- you start confidently, but then you stop. You were going to say thirty-three, but you're not. You're thirty-five. And then you're bothered, because you wonder if this is the beginning of the end. It is, of course, but it's decades before you admit it. I guess I can give no more recommendation, other that to say, it held me so tightly that I read thiswhole book in one weekend... and that's not natural for me! Let me groan again to be sure you heard me... Arrrggghhhhhhh ! Ok.. now ask me why I'm groaning..
Because I've found yet another YA author that managed to capture me.. dang it all! I don't need this! More to the fact.. I can't keep affording this! And, oh yeah.. of course there's already a second book out that I now am itching to send for.. sigh. I have found that, unlike many readers who can read only one book of a series I have this need to read the entire series, one after the other.. at least I'm that way if they are available. Of course if I have to wait for a release of the next book.. well then of course I wait. But then I have to reread what went before in order to feel comfortable with the latest installment. I think I have reached a point (at least financially) that I am almost happy when I don't like the book I am reading... or at the very least, it's only "so-so".. anything not to want to read MORE by said author! Now that that's off my chest.. It's his story .. turning of age... and his life experiences. ...and from there his life's adventures begin. When my mother scolded me for being late, I knew she was worried because she loved me. And we both were relieved that I was home. Even when two of my brothers held me down while a third tickled me until snot came out my nose, I knew I was home. You know you're home when you name is called out, sometimes in welcome, sometimes because you are in trouble, and it rings like a bell. Not spoken on the wind outside your window, hollow, with an unmistakable threat. Home was where I was safe. At that moment, I never felt farther away from home in my life. Buried 'til Next Year, When It Will Rise Again! Well, here it is November 1st... which means that the RIP II Challenge has ended. Although I can't say this is my favorite type of books to read I can say that I found some that I enjoyed very much, and since Carl saw fit to begin the challenge early it gave everyone more than 2 full months to fill any of the challenges. (since I am not a speed reader this helped greatly! .. and of course I knew that this is not a life or death thing that must be accomplished, it's actually just for a nudge to help give you a reason to read. I think Teachers should do things like this in schools.. kids may get into reading more! I had joined Peril the First: Read Four books of any length, from any subgenre of scary stories that you choose. For this I chose: Wildwood/ Gil's all Fright Diner/ In the Company of Ogres/ and Dragons of the Highlord Skies. All of which I read, but upon reading Dragons of the Highlord Skies, I did not think it met the criteria.. and so I read on..
And so this challenge comes to an end... I've read so many great reviews that I will admit I have a longer wish list than I began with! I'd just like to thank Carl for prodding me into taking this challenge... I can also thank him and his readers for making this year in reading one in which I've read more books this year (and still have 2 months to go!) than I have in any other single year of reading! Which leads me to one more thank you to Carl for consistently keeping me so dang broke! Ok that's it for the Perils II Challenge..
On another note, but still about books..